Update: November 19, 3:24 p.m. 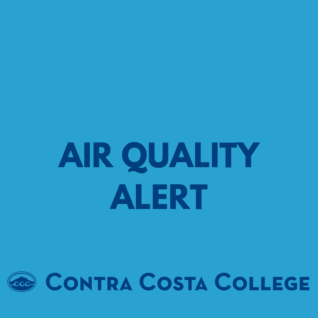 The Contra Costa Community College District (District) has decided to close all College and District operations on Tuesday, November 20, and Wednesday, November 21, due to ongoing poor air quality. The District Office and Colleges (Contra Costa, Diablo Valley, San Ramon Campus, Los Medanos, and Brentwood Center) will resume regular operations on Monday, November 26. While the Bay Area Air Quality Management District is forecasting improved but fluctuating air quality over the next few days, the District has decided to err on the side of health concerns of its students and staff. Contra Costa College Student Services (EOPS, DSPS, Welcome Center, and Admissions & Records) will have extended hours, until 6:00 p.m., on Monday, November 26 and Tuesday, November 27. The last day to drop with a W for full-term classes has also been extended to Monday, November 26 and must be done in-person. Faculty will be communicating to their students what actions they will take to ensure student credit hours are not impacted, which may include adding meetings and/or assignments. Update: November 18, 5:00 p.m.
Due to the ongoing and unpredictable poor air quality we are experiencing throughout Contra Costa County, the Contra Costa Community College District has decided to close all locations – Contra Costa College, Diablo Valley College, Los Medanos College, Brentwood Center, San Ramon Campus and District Office on Monday, November 19, 2018. We hope to re-open Tuesday, but will make a final decision by 3:00 p.m. on Monday. Additionally, the last day to drop with a W for full-term classes has been extended to Wednesday, November 21. These drops must be done in-person. To ensure student credit hours are not impacted, faculty may add meetings and/or assignments. Update: November 15, 3:05 p.m.
Due to the unpredictable and poor air quality we are experiencing throughout Contra Costa County, the Contra Costa Community College District has decided to close all locations – Contra Costa College, Diablo Valley College, Los Medanos College, Brentwood Center, San Ramon Campus and District Office – effective 3:00 p.m. today, tomorrow and Saturday. We will reopen all locations on Monday, November 19, 2018. While the Bay Area Air Quality Management District is forecasting a significant improvement in air quality over the next few days, we believe this decision best serves the safety of our students, staff and community. Update: November 15, 12:00 p.m.
Air quality is in the red zone (unhealthy). Like our partners at West Contra Costa Unified School District, and our sister colleges, Diablo Valley and Los Medanos, we are not cancelling classes at this time. The decision to participate in classes can and should be made on an individual basis. Students who determine that they cannot attend class due to health concerns should consult instructors to make alternative arrangements regarding coursework. N95 masks are available for employees and students at no cost in the Welcome Center, while supplies last. Air quality may fluctuate. Administrators are monitoring conditions. Visit airnow.gov or baaqmd.com for more information.